Kieninger Clock Movement Sets for Clock Makers who insist on the Best! Please Note that parts on this page are only available by internet order - We are pleased to provide telephone or e-mail advice to clock makers but we cannot offer pay and collect. On the Sets 'Options & Prices' page you can modify the contents of the set to suit your project! We also include a drawing showing the primary movement, dial and pendulum, installation dimensions. Oakside will remove the moon arches from all 250mm & 280mm moon dials to provide 250 & 280mm square versions. On the Clock Case Hardware page you will find a selection of useful items, including brass rebate hinges, mortise locks, escutcheons, keys and adjustable cabinet leveling feet for your clock. Oakside use these items on its range of clocks! Please note, when you purchase your mechanical clock parts from Oakside, you are dealing with a dedicated Longcase Clock Designer & Maker, not just a shop! We will readily examine you clock drawings to ensure that your design will be able to accommodate the Kieninger movement of your choice. We will also provide telephone assistance when you are installing the mechanicals and commissioning your clock. Our expertise will ensure that your new clock will perform perfectly! CLOCK PLANS. On the Options and Prices page of each of our Sets you will find a selection of clock plans that Frank has purchased from around the internet; these can be modified to accommodate your project. If this is your first Grandfather clock building project Frank recommends you have a look at our Clocks Built By Others page for inspiration, especially the clock by Pieter van Vliet of Canada - visit his web site and you will find a complete set of plans and fully illustrated guide to building a clock in the style of our Hampshire & Winchester with photos of each stage of construction. 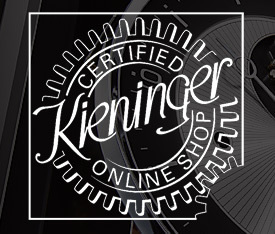 There is also lots of interesting information on the Kieninger Manuals & Interesting Links page. Grandfather Clock, Height 2083mml, Depth 610mm, Width 610mm, Depth 305mm. (Kieninger movement installation drawing included). All of the Movement, Dial and Pendulum Sets listed on this web page can be installed in a clock cabinet built to the selected plan, however you must compare the dimensions stated on the Kieninger movement instalation drawing we provide and decide if you need to make changes to any of the plans cabinet dimensions prior to constructing the cabinet. The standard set includes the following parts: You can modify the Sets contents on the Options and Prices page! Dial: Kieninger 250 x 330mm Moon dial (including hands) with black Roman numerals on a silver chapter ring. Cast spandrels. Shell Fillings: Iron; Strike 2.0kg. Time 2.8kg. Chime 3.0kg. Gongs: 8-rod gong - 680mm. SK 012. Plans: Kieninger movement installation drawing is included with all Sets. Please note that all metal dials are supplied fitted to a back plate with four pillars - this connects directly to the front plate of the movement ensuring accurate positioning. Our sets include all of the parts needed to get your clock ticking and Frank will be please to assist with selection, installation & operating questions! The SK 93cm Pendulum Movement specifications. Hand shaft length 56mm (from front plate to hand shaft nut tip). Plate size 120mm x 124mm x 1.7, 6 bronze bushes, a Kieniramic7 Dead beat Graham escapement, Automatic Tick (beat) adjustment, Control for Silent, Automatic Night silencing 10pm to 7-15am or Continuous chiming. The Hourly chimes and the melodies are played on a 8-rod gong. This movement set requires a minimum measurement of 165mm from the inside face of the dial glass to the inside of the rear panel. The Lyre pendulum with a 165mm bob swings 245mm - the distance from handshaft nut to bob centre is 830mm. The Lyre pendulum with a 220mm bob swings 270mm. The weights need to be able to drop a minimum distance of 1328mm, measured between the centre of the dial and the inside bottom of the cabinet. The distance from the rear panel to the front face of the weight is approximately 140mm. PLANS - We now offer clock building plans on the Options and Prices page, these can be modified in cabinet depth to accept various Kieninger movements. Please note that we ship to Canada, USA, Australia & New Zealand. Click here to view the Set 37 Movement Dials and Pendulums images page. Click here to view the Set 37 Options and Prices page. The SK 100cm Pendulum Movement specifications. Plate size 120mm x 124mm x 1.7, 6 bronze bushes, a Kieniramic7 Dead beat Graham escapement, Automatic Tick (beat) adjustment, Control for Silent, Automatic Night silencing 10pm to 7-15am or Continuous chiming. The Hourly chimes and the melodies are played on a 8-rod gong. Click here to view the Set 42 Movement Dials and Pendulums images page. Click here to view the Set 42 Options and Prices page. Pendulum length 116cm. Chain & Weight Drive. Plays the Westminster melody on the quarters and chimes the hours on an 8-rod gong. Movement: Kieninger SK 012 - 116cm. Pendulum: Kieninger 116cm Timber Pendulum with a 165mm Brass Bob. Weight Shells: Three 40mm x 245mm polished brass shells. Gongs: 8-rod gong assembly - Included. The SK 116cm Pendulum Movement specifications. Plate size 120mm x 124mm x 1.7, 6 bronze bushes, a Kieniramic7 Dead beat Graham escapement, Automatic Tick (beat) adjustment, Control for Silent, Automatic Night silencing 10pm to 7-15am or Continuous chiming. The Hourly chimes and the melodies are played on a 8-rod gong. The Lyre pendulum (096) with a 220mm bob swings 270mm. The distance from the handshaft nut to the centre of the bob is 1040mm. 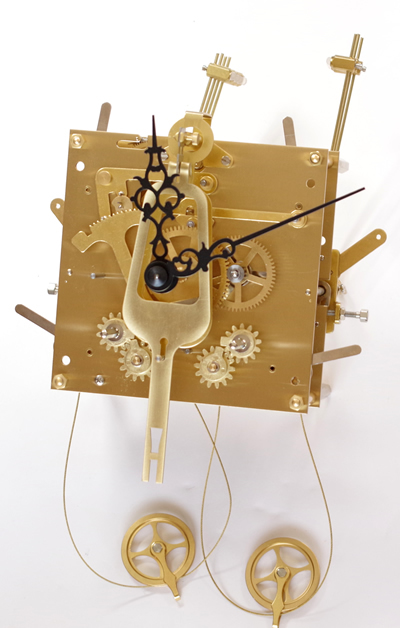 Click here to view the Set 49 Movement Dials and Pendulums images page. Click here to view the Set 49 Options and Prices page. Pendulum length 116cm. Cable & Weight Drive. Maintaining Power. Automatic sequencing of the Westminster, Whittington & St. Michael melodies that play on the quarters and chime the hours on a twelve-rod gong. Dial: Kieninger 280 x 395mm Moon dial (including Serpentine hands) with Brass Arabic numerals on a silver chapter ring. Etched spandrels. Pulleys: Three brass pulleys included. Shell Fillings: Strike 3.0kg, Time 4.0kg (5.0kg for heavy pendulums), Chime 4.0kg. Gongs: 12-rod gong assembly - included. The KSU 50, 116cm Pendulum Movement specifications. Plate size 141mm x 200mm x 2.5mm. 6 bronze bushes, Automatic Sequencing of the Westminster, Whittington & St Michaels melodies, Dead beat Graham escapement, Maintaining power, Automatic Tick (beat) adjustment, Maltese cross, cable winding stops to prevent over-winding, Separate controls for Chimes and he Melodies - The control that protrudes through the left slot in the dial allows selection of - Silent, Automatic Night silencing between 10pm to 7-15am or Continuous chiming. The control that protrudes through the slot on the right side of the dial controls the three melodies and allows selection Silent, Automatic Sequencing or any of the three melodies - The Hourly chimes and the melodies are played on a 12-rod gong. This movement set requires a minimum measurement of 215mm from the inside face of the dial glass to the inside of the rear panel. The weights need to be able to drop a minimum distance of 1260mm, measured between the centre of the dial and the bottom of the cabinet. The timber pendulum with the 140mm Bob has a swing width of 210mm. The distance from the rear panel to the front face of the weight is approximately 185mm. Click here to view the Set 53 Movement Dials and Pendulums images page. Click here to view the Set 53 Options and Prices page. Plays the Westminster, Ava Maria & Ode to Joy melodies on the quarters and chime the hours, on a 16-rod gong. Movement: Kieninger KSU 63 - 116cm. Weight Shells: Polished brass weight shell complete, 60 x 245mm. Shell Fillings: Strike 3.0kg, Time 3.0kg (4.0kg for heavy pendulums), Chime 4.0kg. Gongs: 16-rod gong assembly - included. Please note that all metal dials are supplied fitted to a back plate with four pillars - these pillars connect directly to the front plate of the movement, ensuring accurate positioning. The KSU 63, 116cm Pendulum Movement specifications. Plate size 141mm x 200mm x 2.5mm. 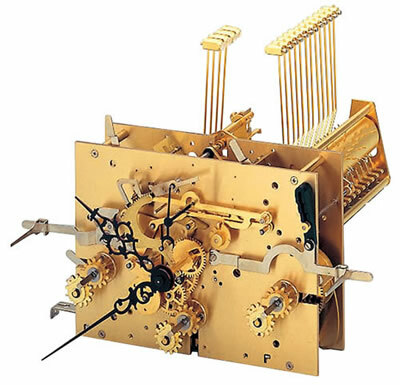 6 bronze bushes, Dead beat Graham escapement, Maintaining power, Automatic Tick (beat) adjustment, Maltese cross, cable winding stops to prevent over-winding, Separate controls for the Chimes and Melodies. The control that protrudes through the left slot in the dial allows selection of - Silent, Automatic Night silencing (between 10pm to 7-15am) or Continuous. 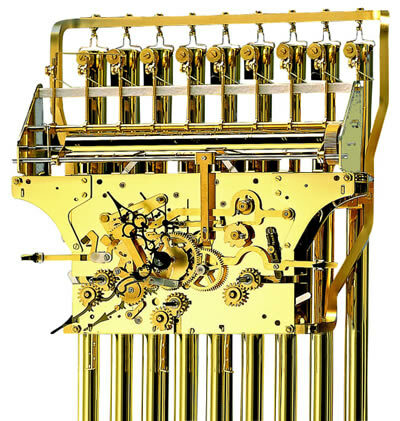 The control that protrudes through the slot on the right side of the dial controls the three melodies - Westminster, Ave Maria (Schubert) and Freude schöner Götterfunke (ode to joy) and allows selection of Silent, any of the three Chimes or Continuous playing - The Hourly chimes and the Quartely melodies play on a 16-rod gong. Please not the this movement only plays the chimes on the hour followed by the hour striking; at quarter past the hour is strikes once; at the half-hour is strikes twice and at 45 minutes past the hour it strikes three times. This movement set requires a minimum measurement of 250mm from the inside face of the dial glass to the inside of the rear panel and the weights need to be able to drop a minimum distance of 1260mm, measured between the centre of the dial and the inside bottom of the cabinet. A timber pendulum with a 165mm bob will swing 270mm. A large lyre pendulum with a 270mm bob will swing 355mm. The distance from the rear panel to the front face of the weight is approximately 220mm. Click here to view the Set 54 Movement Dials and Pendulums images page. Click here to view the Set 54 Options and Prices page. Automatic sequencing of the Westminster, Whittington & St. Michael melodies that play on the quarters and chime the hours, on nine nested brass bells. Movement: Kieninger KSU 55 Nine bells - PL 116cm. Gongs: Nest of nine bells included. The KSU 55 movement strikes the hours and chimes three melodies - Westminster, Whittington & St. Michael on the quarters on a nest of nine brass bells. 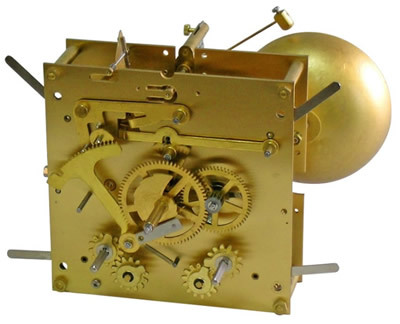 This movement set requires a minimum measurement of 195mm from the front of the hand shaft (inside face of the dial glass) to the inside of the rear panel and to achieve eight-day running, the weights need to be able to drop a minimum distance of 1260mm, measured between the centre of the dial and the inside bottom of the cabinet. As an approximate guide a pendulum with a 140mm bob will swing 240mm, a 165mm bob swings 250mm, a 200mm bob swings 280mm and a 225mm bob swings 280mm. Click here to view the Set 56 Movement Dials and Pendulums images page. Click here to view the Set 56 Options and Prices page. Pendulum length 116cm Cable & Weight Drive. Unique front mounted pendulum. Plays the Bim Bam on the half-hour and strikes the hours, on an 8-rod gong. We can also supply this movement fitted with a single rear-mounted brass bell - please enquire. Dial: Kieninger 280 x 395mm Moon dial (including hands) with black Roman numerals on a silver chapter ring. Cast spandrels. Weight Shells: Brass plated aluminium weight shell complete, 60 x 245mm. The HE comtoise, 116cm Pendulum & cable Movement with bim-bam striking on an 8-rod gong.. 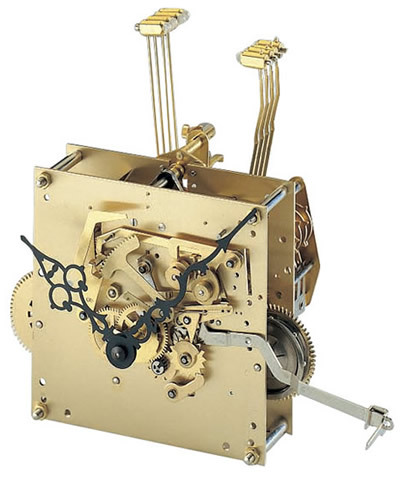 This movement set requires a minimum measurement of 178mm from the inside face of the dial glass to the inside of the rear panel - the timber pendulum with a 165mm bob swings 255mm, the small Lyre pendulum with a 220mm bob swings 270mm and the weights need to be able to drop a minimum distance of (to be determined) mm, measured between the centre of the dial and the inside bottom of the cabinet. The distance from the rear panel to the front face of the weight is approximately 170mm. Click here to view the Set 58 Movement Dials and Pendulums images page. Click here to view the Set 58 Options and Prices page. Pendulum length 116cm Chain & Weight Drive. Gongs: 100mm diameter cast brass bell. The HE BELL, 116cm Pendulum Chain Movement specifications; Half hour striking on a single rear mounted 100mm cast bell. Click here to view the Set 59 Movement Dials and Pendulums images page. Click here to view the Set 59 Options and Prices page. 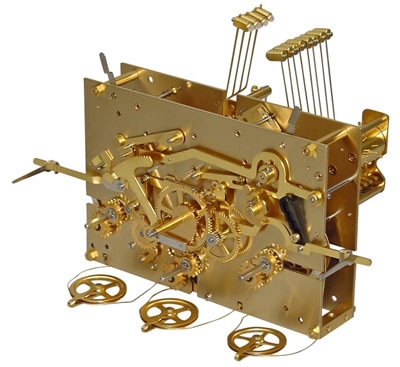 Click here to view the Set 60 Movement Dials and Pendulums images page. Click here to view the Set 60 Options and Prices page. 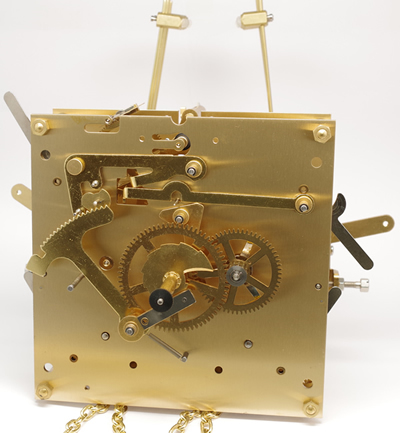 Clockmakers Set 64 featuring the Kieninger HSU, 116cm 01 movement. Plays the Westminster, Whittington & St. Michael melodies on the quarters and chimes the hours, on a 12-rod gong. Pendulum length 116cm. Cable & Weight Drive. Movement: Kieninger HSU 01 - 116cm. Highly polished version. Shell Fillings: Strike 4kg, Time 5.0kg (6.5kg for heavy pendulums), Chime 5.0kg. Gongs: Twelve-rod gong assembly - included. The HSU 116cm Pendulum Movement specifications. Plate size 158mm x 230mm x 2.8mm, 24 bronze bushes and 12 genuine Ruby bushes providing the pivots for the motion work, there is a Dead-beat Graham escapement, Automatic Tick (beat) adjustment Westminster, Maintaining power to drive the pendulum during the winding sequence, Automatic beat adjustment to ensure an even tick, Maltese cross cable winding stops to prevent over-winding, Separate controls for Chimes and he Melodies - The control that protrudes through the left slot in the dial allows selection of - Silent, Automatic Night silencing between 10pm to 7-15am or Continuous chiming. The control that protrudes through the slot on the right side of the dial controls the three melodies and allows selection Silent, individual selection of the three melodies Westminster, Whittington & St Michael or Continuous playing. The Hourly chimes and the melodies are played on a 12-rod gong. For export orders we offer all our sets with or without the shell fillings - this reduces the shipping weight and there is a also a reduction of the kit price! If you can obtain fillings locally, you will require one filling of 4kg & two of five kg - all with a maximum diameter of 56mm and a maximum length of 245mm. On the options & prices page you will find a large range of alternative metal dials & Pendulums. This movement kit requires a minimum measurement of 215mm from the front of the hand-shaft to the inside face of the rear panel and the weights need to be able to drop a minimum distance of 1615mm, measured between the centre of the dial and the inside bottom of the cabinet. The 270mm bob pendulum needs an cabinet minimum internal swing width of 395mm. A Temperature Compensating Pendulum with a 200mm bob needs a cabinet minimum internal swing width of 350mm. The distance from the rear panel to the front face of the weight is approximately 160mm. 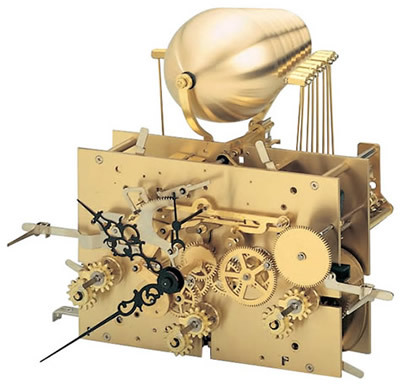 Click here to view the Set 64 Movement Dials and Pendulums images page. Click here to view the Set 64 Options and Prices page. Plays the Westminster, Whittington & St. Michael melodies on the quarters and chimes the hours on nine full length polished brass tubes. Shell Fillings: Strike 4kg, Time 5.0kg, Chime 6.5kg. The HTU 116cm Pendulum Movement specifications. Plate size 158mm x 230mm x 2.8mm, 24 bronze bushes and 12 genuine Ruby bushes providing the pivots for the motion work, there is a Dead-beat Graham escapement, Automatic Tick (beat) adjustment Westminster, Maintaining power to drive the pendulum during the winding sequence, Automatic beat adjustment to ensure an even tick, Maltese cross cable winding stops to prevent over-winding, Separate controls for Chimes and he Melodies - The control that protrudes through the left slot in the dial allows selection of - Silent, Automatic Night silencing between 10pm to 7-15am or Continuous chiming. The control that protrudes through the slot on the right side of the dial controls the three melodies and allows selection Silent, individual selection of the three melodies Westminster, Whittington & St Michael or Continuous playing. The Hourly chimes and the melodies are played on nine full length brass tubular bells. This movement kit requires a minimum measurement of 240mm from the front of the hand-shaft to the inside face of the rear panel and the weights need to be able to drop a minimum distance of 1615mm, measured between the centre of the dial and the inside bottom of the cabinet. The internal trunk width needs to be at least 345mm to accomodate the tubular bells. The 270mm bob pendulum needs an cabinet minimum internal swing width of 395mm. A Temperature Compensating Pendulum with a 200mm bob needs a cabinet minimum internal swing width of 350mm. The distance from the rear panel to the front face of the weight is approximately 190mm. 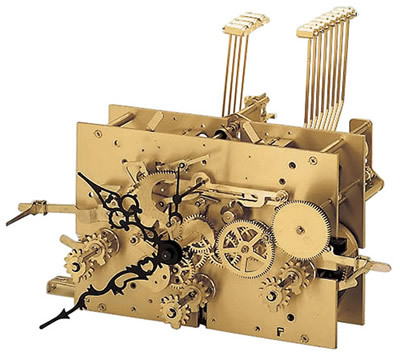 Click here to view the Set 65 Movement Dials and Pendulums images page. Click here to view the Set 65 Options and Prices page.